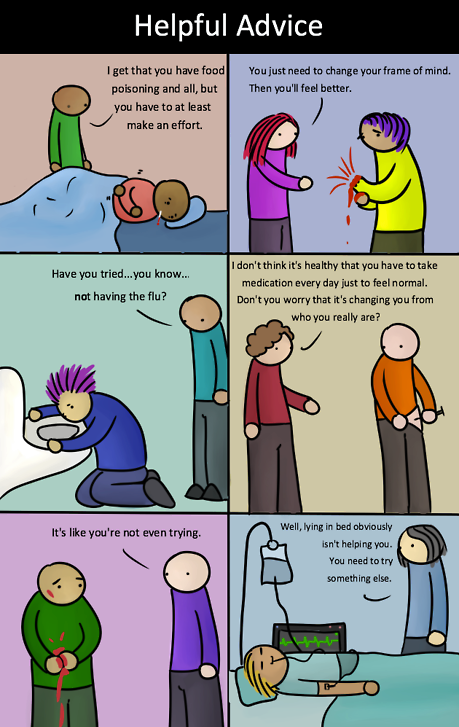 This popped up in my facebook feed the other day with the line “If physical illnesses were treated like mental illnesses.” It took me a few moments (longer than I care to admit) to realize they were serious, you shouldn’t treat people who aren’t feeling well like this. I showed it to my husband — also a former Christian Scientist — he had a similar reaction, clearly the comic didn’t take it far enough, this was all-too-relateable. The comic resonated with me in ways it should not have: I’ve heard all of this “Helpful Advice” when I was ill. Not mentally ill, but hallucinating-high-fever ill, doubled over in bed with cramps that were so bad I could hardly move ill, unable-to-keep-food-down ill. I got “you need to pray harder” or “maybe you should turn to the books.” I was accused of being a Tea Bag Christian Scientist — only turning to it when I was in “hot water,” aka “medicine cabinet” Christian Scientists — only turning to Christian Science when you’re sick. Even though I’ve left Christian Science, it worries me that some of the responses, most recently, “well, lying in bed obviously isn’t helping you” have come out of my mouth. Having been raised around this attitude, it feels like second nature to respond in this way. I don’t just apply it to others, I apply it to myself. I don’t give myself permission to have an off-day. I have to be 100% with-it all the time. I can’t let a headache, or stomach flu get me down! I’ve acknowledged this, and I’m working on changing my attitude — towards myself, and others who are not feeling well. Christian Science lacks empathy. Instead of helping, it encourages others to blame the person who is suffering for not correcting their thought. This culture of empathetic lack is most noticeable at Principia (see “Right Use of Temporary Means” ) and in other Christian Science clusters. 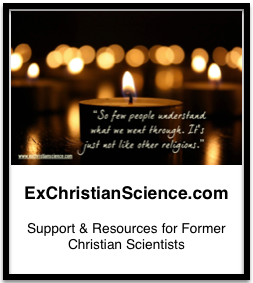 Now, before you go, but not all Christian Scientists are like that, you’re right, not all of them are, but Ms. Eddy’s writings do provide plenty of material to support less empathetic views. I wonder if these “clusters” are mistakes? I don’t no any place where there is a recommendation for like-minded people entirely to be together. It breeds yes-men. I’m still trying to get out of that stupid Christian Science induced mindset of thinking I’ve done something wrong if I’m sick. Damn it, sometimes it just happens! It’s a part of life. And yes, Eddy’s writings do tend to encourage the less empathetic viewpoint.